The true story as is often the case is much more interesting and much deeper. There are in fact quite a few folk making clogs but most use machine cut clog soles sawn on a bandsaw. We should point out here that English and Welsh clogs have always been a wooden sole with a leather upper unlike the French, Spanish or Dutch clogs and sabbots which are all wood, they are also far more comfortable. The most difficult bit of this traditional craft and the bit that people lay claim to being "the last of" is cutting the clog sole with long handles clog knives. You use a set of three knives, the blocker, for most of the shaping, the hollower, to hollow where your foot sits and the gripper, to cut the groove the leather upper gets nailed into. More recently one of the clogmakers who uses bandsawn soles Trefor Owen has also started demonstrating some cutting with knives and gaining a lot of press as "the last full time clogmaker in Wales"
Journalists love to tell the story of the last craftsman on the verge of dying out, it is at the same time compelling and frustrating. It is frustrating because it is a self fulfilling prophecy. So long as there is big national publicity to be gained from being the last one about to die out there is very little incentive to train someone else to work as competition. I know this all too well having taught many people to turn wooden bowls on a pole lathe journalists desperately want to print that I am "the last working pole lathe turner". Occasionally I will tell them that I am still "the last person earning the majority of my income from making bowls on a pole lathe" but surely the fact that there were no pole lathe bowl turners 25 years ago and now there are probably 50 that can do it in the UK and others I have taught in Japan, Sweden the USA and across Europe is a far more interesting story? Apparently not what sells papers and Radio is the last of the line story. How then do we encourage people to take on an apprentice? He isn't any different from a number of clogmakers who make or buy machined soles. There's nothing different in his work. 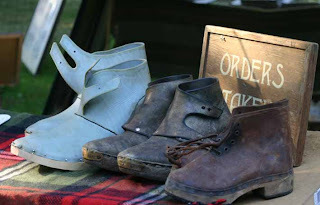 Machined sole, 20th century upper designs, thin spray painted leather and soles derived in design and function from the Walkelys mass produced soles he used to buy in. Hang on...not all English clogs were leather uppers. In Lancashire all-wooden clogs were made too. There was a feature on North West news sometime in the 1990s where a clogmaker made a pair of all-wood for an Asian man with oversized feet who couldn't find shoes to fit. My grandad had two pairs of clogs from the pit as well, one with leather uppers, one all-wood.